Year over year sales growth continues. The Toronto Real Estate Board reported 88,462 sales, a 6.6% increase compared to same time last year. 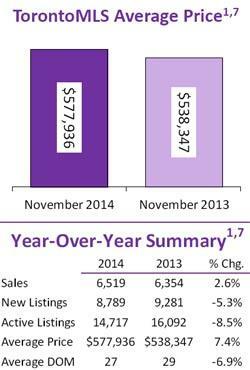 Buyers Remain Active in November. Average Price up Over $39,000. 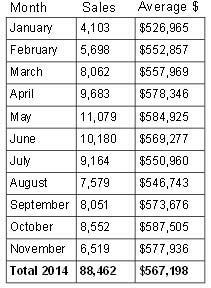 The average selling price for November transactions was $577,936 up 7.4% from 2013. The year to date average price was up by 8.4% to $567,198 even with a constrained supply of homes for sale in many parts of the GTA. High Demand WIll Continue to Lead Price Growth into 2015. Canada's housing market is not in bubble territory and faces "very little risk" of a downturn according to the Canadian Mortgage and Housing Corporation. Just in time for the holidays, create a feeling of warmth and tranquitily with new paint colours that make staying indoors feel more like a retreat than a requirement. Coupon expires December 31st 2014. 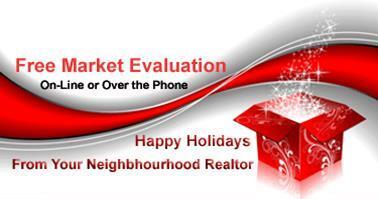 Do you know someone thinking of Buying or Selling? We love referrals and sincerely appreciate each and every one we recieve. If you were satisfied with our service, please send your friends and family our way.Thank-you! What you see is not always what you get. Avoid costly surprises by listing items like the appliances and water heater, called "chattels", in your offer. Watch the video to learn why it's important to get all the details in writing. Beacon Condos Luxurious Living at North York City Centre Starting from the High $200s Special 2014 Holiday Incentives: 3% off 1 Bedroom Suites 5% off 1+Den, 2Bdrm & 2+Den Suites FREE Window Blinds Free Assignment ($5,000 Value) Capped Development Charges Lease During Occupancy Underground access to North York Centre Subway Station. Inventory is going fast! Contact me for Floor Plans, VIP Pricing and Exclusive Buyer Incentives.